Calvert Hall easily proved to be the best boys’ lacrosse team in the state, and perhaps the nation, with a convincing 17-3 victory over Loyola Blakefield in the Maryland Interscholastic Athletic Association A Conference championship game May 18 at Towson University’s Johnny Unitas Stadium. A crowd of 5,684 saw coach Bryan Kelly’s Cardinals post the most lopsided victory ever in the A Conference finals. In the process, top-seeded Calvert Hall made amends for last year’s loss to Gilman in the championship game and won its first title since 2003. Senior attackmen Ryan Brown and Carter Brown had four goals apiece for the Cardinals, who scored 10 unanswered goals at one point after a close opening quarter. 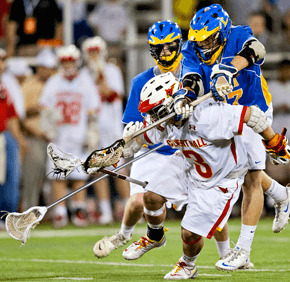 In the regular season meeting between the traditional rivals, Calvert Hall scored the first eight goals. To view a slideshow of photos from the game, click the arrows below.